I first had vaca frita de pollo at a local Cuban restaurant here in Atlanta and I was hooked. Not only did I love the flavor of the chicken but I also loved the slightly crispy pieces. 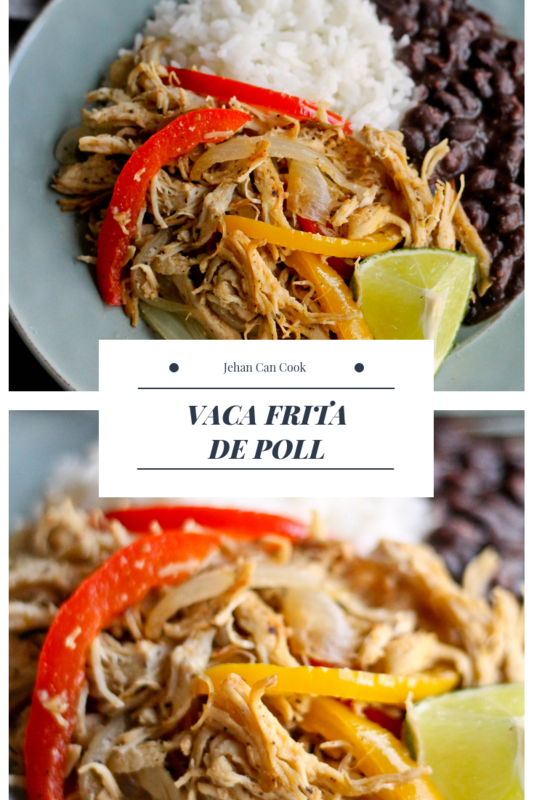 I’m no expert on Cuban cuisine so I did a search on how to make vaca frita de pollo and found that it’s not complicated to make. 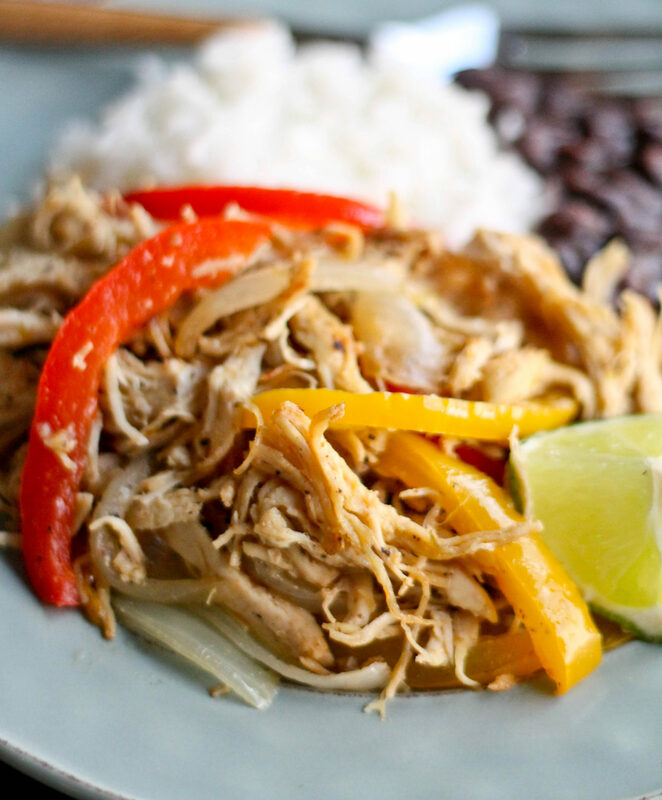 Vaca frita de pollo is chicken that been poached, shredded and fried until crispy with onions and seasonings. I usually serve it with yellow rice or white rice, black beans and plantains the same way that it was served in the restaurant. I love the food from the Hispanic Caribbean islands like Puerto Rico, Dominican Republic and Cuba. There are some similarities to our dishes and there’s no surprise since we do have the same ingredients and there are some Spanish Influence in the english speaking Caribbean countries and Guyana. It’s a shame that I haven’t explored more of that region and will try to share more of those recipes with you. 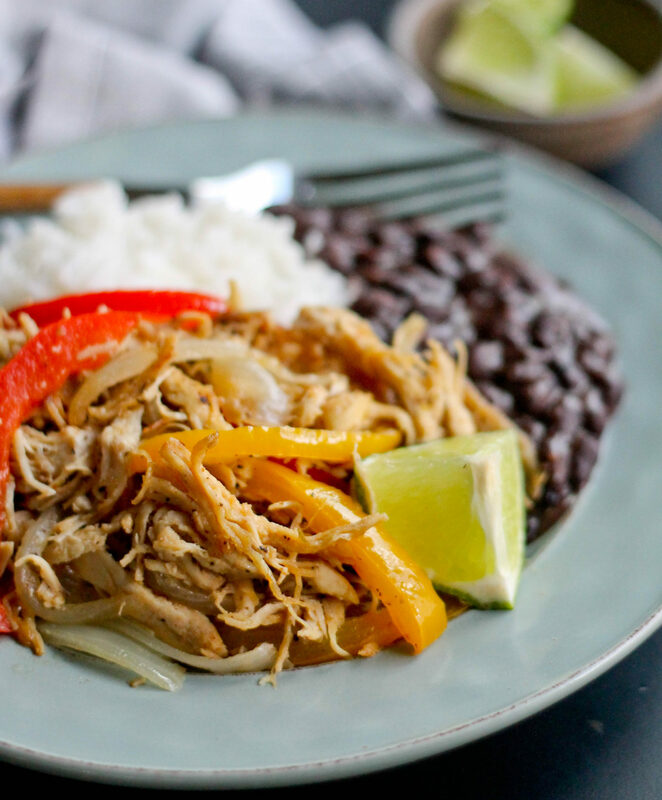 I’ve made pollo vaca frita many times over the years and I’m going to share with you how I make mine. I start by poaching chicken breast in chicken broth with half an onion and a bay leaf. I let is simmer until the chicken breast is easy to shred. I then make a mojo sauce with orange juice, lime juice, olive oil, garlic, oregano and cumin; the mojo gives the vaca frita de pollo a ton of flavor! 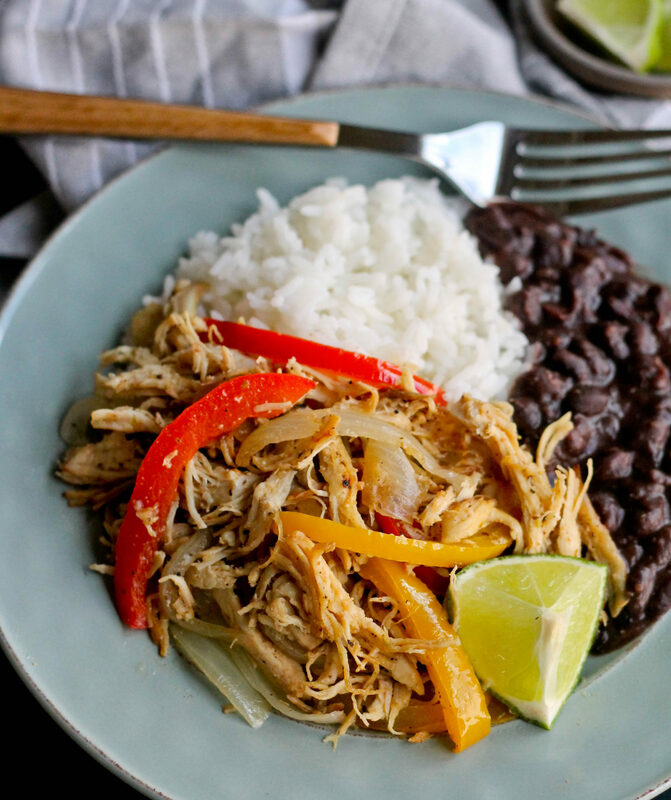 In the final step of the vaca frita de pollo, I fry the shredded chicken with the mojo sauce, onion and peppers and let me tell you – it so amazing!!!! The authentic version doesn’t seem to have sweet peppers in the dish but I’ve had it that way and loved it. If you haven’t had this dish before, you must give it a try. I hope my recipe has a stamp of approval from my Cuban readers. Place chicken breast in a pot with enough chicken stock to cover, bay leaf and half an onion and boil. Cook until the chicken is easy to shred, about 35 minutes. Remove from heat and strain. Shred chicken and then set aside. Combine orange juice, lime juice, salt, black pepper, garlic, oregano, cumin and olive oil. Place a large frying pan over high heat. Add shredded chicken and mojo sauce and cook until the sauce has evaporated. Add sliced onions and bell pepper and fry until chicken is crispy about 2-3 minutes. Remove from heat and serve warm.